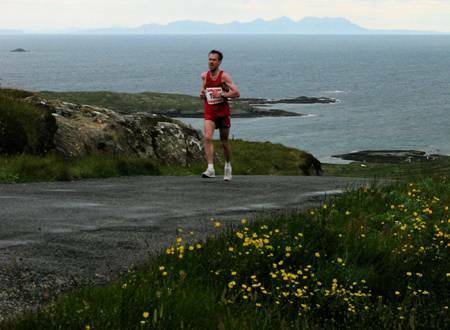 The Scottish Marathon Championship in the 2000’s has been dominated by two men ; one is Simon Pride (2000, 2001, 2004 and 2006) and the other is Jamie Reid (2002, 2003 and 2007). Jamie is the archetypical endurance runner, slightly built, quiet and undemonstrative, racing frequently winter and summer his manner and demeanour are those of most successful Scottish marathon men. And like most successful marathon runners he runs on all surfaces – track, cross-country, ultra distance and hills as well as on the roads. The growing trend these days of road runners shunning other endurance challenges is unfortunate when you look at how the greats of the event trained and competed. His quiet manner manner. and possibly the reduced profile of marathon running in the country, have meant that Jamie is not as well known as he should be. To put this right we have two contributions: the first article below is by an admirer of Jamie’s Colin Youngson, no mean marathon man himself, and the second is Jamie’s own account as told in replies to a questionnaire. The second is particularly revealing and informative. Jamie Reid won the Scottish marathon title three times: in 2002, 2003 and 2007. In addition he won silver medals in 2005 and 2006. Overall he was the most successful Scottish marathon runner (along with his rival Simon Pride) in the ‘noughties’. He first appears in the Scottish athletics results in 1998 when his time for the 3000 metres steeplechase was a respectable 9:49.62. Next year he ran 10K in 31:01, a half-marathon in 67:09 and a full marathon in 2:25:39. 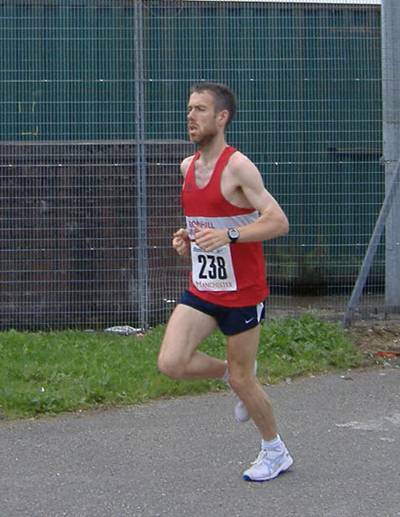 He also competed in the Edinburgh to Glasgow Relay three times for Law and District AAC, running Stage One in 1998 and Stage Six in 1999 and 2001. In 2000 after finishing a fine ninth in the Scottish Cross Country Championship, his 10K Road time was reduced to 30:49 and his marathon time (at London) to a lasting personal best of 2:21:16. Four weeks earlier he had taken the very last UK Inter Counties 20 Mile Championship at Spenborough in 1:47:59 running for the West of Scotland. In 2003 he reduced his ten mile time to 48:51 but in the Moray marathon in Elgin on the last day of August over a much slower course he retained his Scottish title in 2:34:08, still three minutes ahead of his closest rival. A year later Jamie was still under 70 minutes for the half-marathon, yet he also ventured successfully into the world of ultra-marathon racing. After a fairly close battle with the other medallists, he recorded the good time of 3 hours 10 minutes 53 seconds to win gold at the Scottish 50K road Race Championships at Glenrothes in May. 2005 featured battles between two Cambuslang Harriers team-mates. At the end of May over the testing Dunfermline half marathon course, Jamie Reid won the Scottish title in 71:24, just 44 seconds in front of Robert Gilroy. However in August Robert got his own back at the Edinburgh Marathon (incorporating the Scottish Championships) when he won gold in 2:26:42 leaving Jamie with silver in 2:30:51. The Baxter’s Loch Ness Marathon in 2006 was a great race. Kenyan Zachary Kihara only just won in 2:22:23 with Simon Pride second, 2:22:23 and Jamie third in 2:24:04. 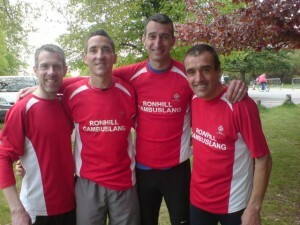 In addition Simon won his fourth Scottish Marathon gold medal and Jamie his second silver one. 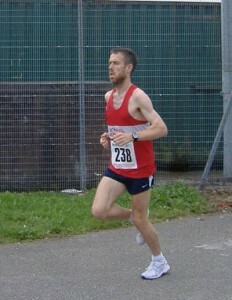 Jamie Reid gained revenge in the 2007 Moray Marathon at Elgin which was also the Scottish Marathon Championship. On a difficult course he engaged in a tremendous struggle with Simon Pride eventually winning his third title by 35 seconds in 2:33:11. Earlier that year he produced an excellent fifth place in the Scottish Cross Country Championships leading Cambuslang to silver in the team contest. Then in 2008 Jamie continued his good cross-country form with ninth in the National leading Cambuslang to team gold. To sum up, so far Jamie Reid has had a very good distance running career. To win a UK Inter Counties Championship, six individual Scottish Senior titles and another two silver medals is outstandingly consistent. Add to these five team golds, two silvers and a bronze! His resolve to concentrate on championship performances is extremely unusual for a Scottish performer in the twenty first century. He should be a good role model for aspiring marathon runners in the next decade. In 2010, Jamie recovered from a major injury and started running well once again. In the Scottish Masters Cross-Country Championships in Forres he launched his veteran career in style. Fourth place in the race placed him second M35 and second counter for the winning team. 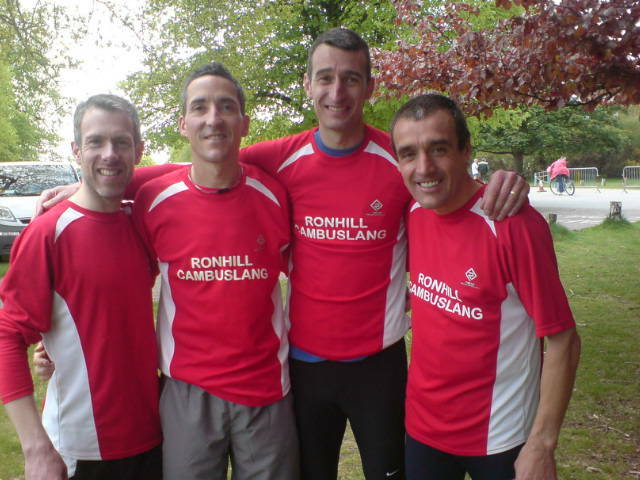 Then his Cambuslang M35 team made a successful raid south to win the British Masters Athletic Federation Road Relay in Birmingham. The successful BMAF team – Jamie on the left. The Jamie Reid story has several chapters to go yet! What Started You Running? My first ever organised race was for 1st Cambusnethan Boys Brigade Company in the Wishaw Battalion Cross Country Championships in January 1985 at Cleland Estate. It was in the Junior event (P7, S1 and S2 school tears) and I finished from memory in fourteenth place as a P7. I played a lot of football and was always on the go so I had a decent general all round fitness. Running races was just a once a year thing for me and the next year I managed to get sixth place I think, in the same event which was enough to get me selected to represent Wishaw in the Scottish Boys Brigade Cross Country Championships in Caird Park, Dundee in March 1986, This was a big event and I managed to come home in around 50th place. I enjoyed it and felt that if I began to do some training I could win the Wishaw Championships the following year, and it was this that kick-started my interest in running. I did manage to win the Wishaw event in January ’87, qualifying me for the Scottish BB Championships again, this time at Falkirk. I trained a bit for it, but was too inexperienced and was up into second place by halfway but faded to about twentieth. However I remember reading the programme and and spotting that Allister Hutton had once won a Scottish BB Cross-Country title and this fired my ambition ot get my name on the winner’s list some day – unfortunately the best I ever managed was second. The following year, 1988, I competed for my school in the Lanarkshire Schools Cross-Country Championships finishing fourth, and then in the Lanarkshire Schools 1500 metres on the track winning in 4:30.1 which was a championship record at the time. It was after this that I joined Law & District AAC. Marathon Training. Originally this was built on the Lydiard principal of three long days a week, and this was the basis for three of my four fastest marathons including my PB. Monday and Friday were almost always easy days when I jogged for five miles. Tuesday, Wednesday and Thursday I ran five miles in the morning from my parents home in Cleland to my workplace in Motherwell, carrying my breakfast and some change to buy a newspaper to read at lunchtime. On a Tuesday and Thursday evening I would run home usually for 95 minutes – called it 14 miles – with a steady 10 miles on a Wednesday night. This was the pattern when not specifically preparing for a marathon. During the last ten weeks or so before a marathon I would increase the Tuesday and Thursday runs to 18, 12 and 18 respectively. In the last five to six weeks, I generally added some reps of five minutes fast with short recoveries, one to two minutes, on the Wednesday evening run. Saturday morning was the long run day, up and around the farm roads around Cleland, reaching the exposed moorlands around the Blackhill TV transmitter, and down the ClydeValley in the other direction. This was usually anything from 150 to 190 minutes, covering anything from 22 to 28 miles. Sunday was usually a steady 10 miles. I always preferred the Saturday long run as I could relax afterwards for the remainder of the weekend – I always had a sense of dread for the long Saturday runs and also for the midweek two hour runs as I didn’t enjoy them at all. So much so that I decided to drastically revise my training in the autumn of 2001 in an attempt to gain an improved performance. I had run a disappointing 2:29 at Berlin in September 2001 with a background similar to the above though with more speedwork and track sessions in the last eight weeks. Therefore in an attempt to qualify for the Manchester Commonwealth Games (sub 2:18 was required) I aimed for London 2002. Training was seven to eight miles number stride fartlek (from Ron Hill’s autobiography) on a Monday. Tuesday and Thursday were both strong paced morning runs of 4.5 miles (to work) and another strong paced nine miles at night. Wednesday was 4.5 miles light fartlek in the morning with nine miles at night including 3 x (5 minutes fast with 2 minutes slow). Friday was an easy five miles. Saturday was mostly and easy four miles in the morning with a race in the afternoon, or just a session with a faster paced long run on the Sunday of about 18 – 22 miles. This resulted in a disjointed season due to various injuries (missing the National Cross-Country), but the performances were decent when I managed to get consistent training behind me in the spring. I decided to miss London as I felt I was not ready, due to the time missed through injury, and entered Lochaber instead as it was two weeks later giving me a further two weeks of training. These were essentially my two different training approaches with results of 2:21:16 and 2:21:46 respectively for my fastest marathons. The former approach was consistently around a hundred miles a week with the latter 89-90 (though with injury this averaged around 50 – 60 in the three months beforehand. Favourite Race Memories. The first was my debut marathon at Inverclyde in 1998, the second was winning the UK Inter-Counties 20 Mile Championship at Spenborough in 2000 and my most recent marathon win – Elgin 2007. My first marathon was the Scottish Championships at Inverclyde in September, 1998 in which I struggled badly. During the early part of that summer I had managed some pb’s on the track including an 8:30 3000m and a 15:16 5000m. I had been using a heart rate monitor for all of my runs and had begun to focus on three long runs a week which brought my fitness on well. I managed to get regular midweek runs of 90 minutes with a week-end run of 2.5 hours or so. I planned to do my first marathon with this schedule in mind and pencilled in a few races. Beforehand I caught a cold, around four weeks prior to the race, then began easy jogging. I had to miss some of the planned races, but nine days before did a two mile race at Dunfermline which was disappointing. On the day of the race, I was pretty nervous. I had driven around the course a few weeks earlier, so I knew there were a few loops round Greenock early on, followed by a run out to Port Glasgow, then turn back, passing the finish area at about 15/16 miles and heading out on the road to Largs before turning back at about 21 miles. I set myself the target of 6-minute miling and was on this pace for the early miles without any significant problems, other than some blisters. These would soon become the least of my worries! I took the pace fairly steady as I had read many stories of the final miles turning into a disaster, but I was respectful of the distance. The leaders were a few minutes in front but I wasn’t concerned with them. I had not taken on many drinks as I struggled to get any water from the plastic cups. All seemed to be going fairly well as I hit the turn at around 20 – 21 miles when I remained on course for my target of 2:37. Soon after this however I hit the dreaded wall with a large thud. The next few miles were becoming increasingly difficult and at 23 miles I had to walk. I was raising money for the St Andrew’s Hospice in Airdrie and had a lot of sponsorship so I was determined to finish. After a minute or two of walking, I just envisaged going for a three mile route from home and thought to myself whatever pace it takes get to the finish. People whom I hadn’t seen since the start line were now passing me and I was absolutely spent. My final position in the race I could now do nothing about.- it was all I could do just to finish. I eventually crossed the line in a very painful 2:49. the satisfaction afterwards was tinged with disappointment by failing so badly during the last few miles. When I got home, I gathered several running books together and made notes of all the areas where I believed that I had gone wrong. My diet at that time was based firmly on the notion that carbohydrates were everything and with hindsight this caused several problems. Any time I caught the cold, this turned into a nasty bug which lingered for several weeks with a deterioration in performance resulting. Despite trying everything from resting completely for a week at the first sign of a cold, to jogging for three miles a day, nothing helped. It was only after this marathon that I became aware that I was very much lacking in protein. As soon as I corrected this imbalance, I suffered fewer colds and, encouragingly, no loss of performance afterwards. I had planned for three weeks of complete rest afterwards so I was itching to get back into competition again. In my second marathon a year later after taking on board the lessons learned, I managed to take twenty four minutes from that first attempt. In 1999 after running 2:25:39 in my second marathon (Dunfermline to Edinburgh), and taking nearly 25 minutes from my pb, I targeted London in April 2000. I decided to repeat the build-up of my earlier run and do a hard 20 miles four weeks beforehand. Checking the fixture lists, I could see that the *UK Inter Counties 20 Mile Road Race Championships in Spenborough, Yorkshire, was exactly four weeks beforehand. I therefore contacted Scottish Athletics indicating my wish to be entered as part of the West of Scotland team, which I was. Unfortunately, however, I was the only member of the team, with no other Scots being entered. As the race was on a Sunday, I decided to go down the evening before with my parents and stay in a hotel reasonably close to the race. Late Saturday afternoon, I checked the oil and water in the car before setting off. Just before crossing into England, I notices smoke coming from my exhaust and shortly afterwards the temperature of the engine rose dramatically before a loud bang came from under the bonnet – promptly followed by the car shuddering to a halt. As we inspected the engine it quickly became apparent that I had forgotten to put the oil cap back on! So sitting about five miles south of Carlisle, in a car with a blown engine, and a 20 mile race the next day, some quick thinking was necessary. A call to the breakdown company was first. They arrived promptly, towed the car to their local garage, advising of the damage and consequences, before dropping my parents and myself at Southwaite Services. The hotel room was cancelled and fortunately my brother Fraser was able to drive down from Hamilton and pick us up, eventually dropping us off at home around 1:00 am on Sunday. With the race at 12 noon and wanting to be there for 11:00 am, a decision had to be made on whether to go to the race. Getting there meant leaving home around 6:30 am, giving little time for sleep, breakfast, etc, but with my Dad sharing the driving I was able to sleep some of the journey down, getting there shortly after 11 am. Despite having run 2:25 for the Dunfermline to Edinburgh marathon around five months earlier, and having got in a good level of training during that time, I was pretty nervous at the start. I noticed a profile of the course on a wall and noted that the first half of the course was tougher than the second. The race was over some very undulating short and long laps with some of the biggest hills I’ve encountered in a road race. Decision was made – a steady start was essential. If the rest of the guys were to beat me, then good luck to them. The race started and finished on the track and after hitting the roads, the early pace was strong. The sun was out and there was a strong breeze in the exposed areas of the course. Between miles four and eight I went through a bad patch mentally and physically where the leaders got away from me leaving me trailing by a minute. I had only managed to get half a cup of water – I hadn’t practised taking drinks from plastic cups before (my own fault) and didn’t want to contravene any laws by taking a drink from my parents who were driving around the course. My time at 10 miles was exactly 55 minutes and I was lying back in about eighth place. Slowly over the next few miles I began to pick up, passing some of the guys from Yorkshire and gaining on the leaders. As I got up to around fourth or fifth a car kept coming up alongside me asking which county I was from – they were obviously part of a county who had a chance of winning a team title. I took umbrage at this – why should I interrupt my concentration and my breathing just to satisfy their curiosity – and just gave them a look. They continued to drive alongside for a bit asking again and again, but I didn’t respond. Now I was really gaining in confidence as I moved into a medal position and I was catching second place. By 17 miles I was in second place and catching the leader – slowly but surely. At a steep downhill I knew I would catch Ian Fisher of Otley Harriers and did so at 19 miles – I think he got a shock. I managed to get past and pull clear for a 14 second win crossing the line in 1:47:59. I had a sense of deep satisfaction from coming through the field and getting the win. An old friend of my Dad’s, a former teaching colleague at Larkhall Academy, Ajid Singh, had managed to finish the race in between three and a half and four hours – not bad for someone in his 70’s – and sent up a nice letter afterwards with some local press cuttings with details of the race describing the winner as ‘the diminutive Scot’. Ian Fisher was to gain revenge four weeks later, as he pipped me at London clocking 2:20:27 to my 2:21:16. My most recent Scottish title was at Elgin in 2007 where I had my first marathon victory over Simon Pride. The previous day, my girlfriend Roisin and I had driven north as she was competing in a a six-a-side shinty tournament near Inverness for her club, Tir Connail Harps from Glasgow. I spent the afternoon watching the tournament, drinking diluting juice and eating large amounts of cake! Afterwards we drove to a B&B in Elgin where we checked in and went out for a meal. We settled for some pizza and relaxed talking about the shinty that afternoon and the race the next day. I wasn’t really nervous as I wasn’t expecting much as recent races hadn’t gone particularly well. I had hit the over-training button again as I had logged a tremendous mileage (maximum of 144 miles per week), switching to this after my best ever fifth place at the National Cross-Country Championships in February. It hadn’t improved me, only made me worse. Never mind, I entered the marathon, hoped for a solid run and then I could look forward to the autumn relays – my favourite part of the season. The morning of the race we had coffee in the hall after picking my number up. I saw that Simon Pride was entered, along with Adam Reid from Peterhead and David Gardner from Kirkintilloch whom I knew fairly well. Early pace was slow as the four of us settled down and let the countryside pass by. The day was warming up and there was little wind. I managed to get some drinks from Roisin as the race progressed, with the pace beginning to pick up as we passed Burghead (c14 miles). Simon and David pulled away and I knew it was too fast for me. In the distance I could see Simon moving ahead of David, but as we neared Lossiemouth, I could see I was gaining some ground. The sun by now was shining fiercely and I could sense a silver medal. I managed to pass David in Lossiemouth offering words of encouragement to each other, and I now looked to see how far ahead Simon was. He was out of sight. Still, always believe – funny things can happen in the marathon. I finally caught sight of him as we entered the woods around 20 miles and I checked his lead in seconds. I can’t remember exactly but it must have been at least a minute. After a mile or so, I checked again – it was now around six or seven seconds less. A quick calculation in my head told me it would be close if we maintained the same pace, so I pushed on. Three miles to go, I could see Simon more clearly now and I calculated I could catch him by the end if we both maintained the same pace. Roisin was at this point in the car and she drove quickly back to the finish. Every step was taking me closer to Simon now and the Scottish title was back in my head. What will happen when I catch him? How much has he left? Is he tiring or just unaware that I’m coming through? I caught Simon just as we entered the outskirts of Elgin, around a mile to go, and I decided to give it a push on to try to discourage any attempt to try to stay with me. Thankfully for me it worked and I went on to win in 2:33:11 with Simon not far behind and David taking bronze – marathon title Number Three! A slow time for all three of us, and perhaps highlighting the dropping standard, but it was one of the few marathon races I’ve run which had been tactical and a real ‘race’. I knew that Simon had been past his best, and neither David nor I had been at our best, but it remains a very happy day for me. The rest of the day was spent celebrating with ice-creams in Lossiemouth before driving south to Aniemore where we spent the night and I stuffed myself with burger and chips, washed down with chocolate fudge cake and ice cream! That’s as honest and informative a series of answers as any that has appeared in any questionnaire, either here or in any of the running magazines: I also find it interesting that one of his most memorable races is one where he did not run at all well and the details of training are always fascinating for other runners and coaches to see. As a triple Scottish Champion Jamie Reid is well worth his place in any list of national marathon stars.